Renewable energy is a hot topic in the new Obama Administration. Wind Energy is being touted, especially in Texas, as a solution to global warming and U.S. dependence on foreign oil. Wind farms have sprouted all across Texas. Texas is now the leading wind energy producing state. Texas utilities are about to spend billions of dollars extending high-voltage transmission lines into West Texas and the Panhandle, opening up those areas to additional wind energy projects. The Texas Panhandle will see the next boom in wind energy development. Having grown up in the Panhandle, I can verify that the wind blows there. Three points are good to keep in mind when reading stories about renewable energy in general, and wind energy in particular. First, it is important to distinguish between two different goals being pursued by the Obama Administration: freedom from dependence on foreign oil, and reduction of carbon emissions. Wind energy is “clean,” because it does not produce CO2. To the extent that wind energy can replace conventional coal- and natural gas-burning power plants, it therefore reduces CO2 emissions, thus fighting global warming. But wind energy has little or no effect on imports of oil, which is mostly used for fueling cars and trucks. If and when the auto industry solves the battery problem and is able to produce electric cars, wind energy could contribute to reduction in oil imports. Second, it is important to understand that, although wind farms are increasing exponentially, they contribute only a tiny portion of the nation’s total energy consumption. 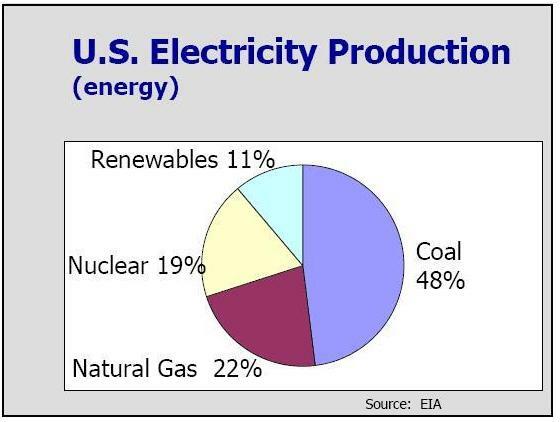 According to the Energy Information Administration, as illustrated below, in 2007 wind energy contributed only 5% of 7% of the nation’s energy — .35%! 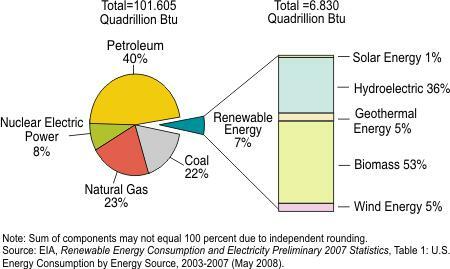 But wind energy again makes up only a small percentage of total renewable energy sources used for electricty production. By far the largest contributor is hydroelectric power, a source that is already largely developed. Third, wind is not an efficient or reliable source of electric power. Electricity is generated only when the wind blows, and that may not be when consumers need the electricity. Utilities must therefore still have available coal and natural gas power plants to provide electricity when the demand arises, even if the wind is not blowing. Again, until we can solve the battery storage problem so that wind energy can be stored as electricity until it is needed, wind will be only a small contributor to the nation’s energy problems.